XRP, the cryptocurrency created by Ripple for cross-border payments, plunged to its lowest levels of the year on Thursday. Most cryptocurrencies were also down, continuing a year that has been marked by heavy losses. 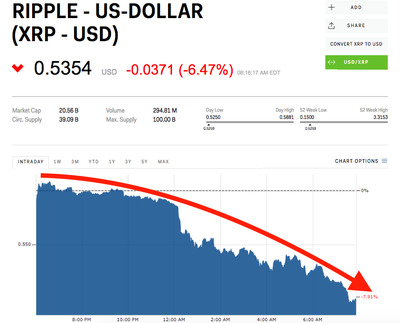 Ripple’s XRP cryptocurrency plunged to its lowest levels of 2018 early Thursday morning, down as much as 7.8% to $US0.525 per token on a day when most major coins also saw heavy losses. The last time XRP, the third-largest cryptocurrency by market cap, was trading this low was December 2017, according to historical data from CoinMarketCap. Bitcoin, still far and away the largest and most prominent cryptocurrency, was down 5.2%, below what the London Block Exchange said was below a “key support level,” that appears to be denting sentiment across the board. Ethereum, the second-largest cryptocurrency, also declined to a 2018 low on Thursday. It’s also been quickly securing new customers for its liquidity and settlement products for cross-border payments, most of which are powered by XRP. Spanish bank Santander is set to launch an international money transfer app with Ripple, Business Insider reported last week. Despite the steep losses in 2018 so far, many investors believe the peak has yet to come for many cryptocurrencies. Bill Barhydt, the CEO of crypto wallet startup Abra, told Business Insider this week that he believes the market will recover this week as more institutional money invests in the asset class.